The hotel Fergus Espanya is a historic hotel in Calella, one of the classic summer holiday destination in the Maresme coast, very close to Mataró and less than an hour’s drive from the city of Barcelona. Working over 50 years to accommodate hundreds and hundreds of guests that arrive from all over Spain and Europe, making it a a model and reference in the area, recognised throughout the country for its long and successful career. Despite the years, the hotel has again received in 2013, the excellence award granted by TripAdvisor’s users, where it is especially valued for its familiar and welcoming atmosphere, personal attention and excellent location, in the beautiful town of Calella. A symbol off the importance of tourism in the Catalan coast, the Fergus Espanya hotel, belonging to the hotel chain Fergus Hotels, continues to work just like the first day regarding quality and service, at the same time that it has refurbished and modernised its services and amenities. In 2010, the hotel completely renovated its 80 rooms in Calella, where visitors can enjoy amenities such as TV, telephone, private terrace, WiFi access and safety deposit box. In addition, a new type of room was designed, the silver and golden rooms, with special benefits and amenities. 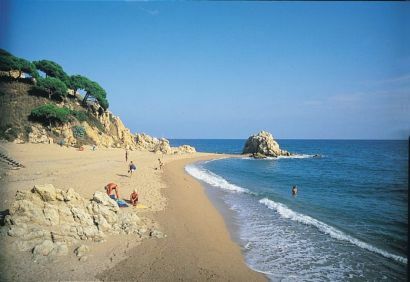 “The welfare of our customers is our daily triumph”, claims the hotel management, who acknowledges the industry’s vitality of Calella as a main destination on the coast of Catalonia. Most notable are its services, entertainment and beaches. Animation is daily and includes activities for children and adults, as well as professional shows and live music of all kinds. However, the main attraction of the hotel is its beach club: a bar located on the sand, with snacks, drinks and hammocks, which has its own program of activities.